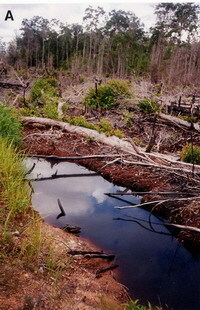 Kalimantan Tengah (Central Kalimantan, Kalteng, 153 000 km²) has a large remaining area of Peat Swamp Forest (PSF). This is a unique and highly diverse tropical ecosystem which is extremly sensitive to logging, clearcuts and agricultural land conversion. Uncontrolled economic exploitation will have major implications on biodiversity, ecology, hydrology and the regional climate. The natural resource function of PSF as a resource of biodiversity and secondary forest products, as well as a carbon sink and as an area for flood mitigation must be preserved. The first visit to Central Kalimantan was for three days with my wife Lucia, 9th to 11th June 1995, where we made a boat tour on the black water river Rungan from the village Sei Gohong to the north. This is not far from village Tangkiling with the 7 Granit hills, which is located approx. 30km north from Palangkaraya, the Provincial Capital. Small boats transport the important goods the river up and down, which could be heart from the guesthouse in Sei Gohong. The Kalimantan highway from Palangkaraya over Tangkiling to Kasongan let through peatland with partly cuted PSF along the road and swampy area with small rivers. On the Katingan river with the huge bridge in Kasongan, where Dayaks cleaned rattan for sell. We met Prof. Usop the former Rector from the Univerity of Palangkaraya (UNPAR).